Who knew the Ukraine was home to such a diversity of heirloom paste tomatoes? At an average 6 oz., this one is slightly larger than the Icicles. 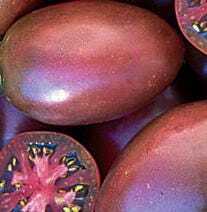 It is a solid reddish-purple shade inside and out, making for striking visual appeal to match its husky deep flavor. Meaty with few seeds. Slow to ripen, with prolific late production – not for short season areas. Also known as ‘Russian Purple’.